Heat oven to 350° F. Spray 10-inch skillet and 2-quart casserole with cooking spray. Cook barley in skillet over medium heat about 8 minutes, stirring constantly, until light brown. Stir in remaining ingredients except green onions. Heat to boiling. Spoon mixture into casserole. Cover; bake about 50 minutes or until vegetables are tender. Sprinkle with green onions. 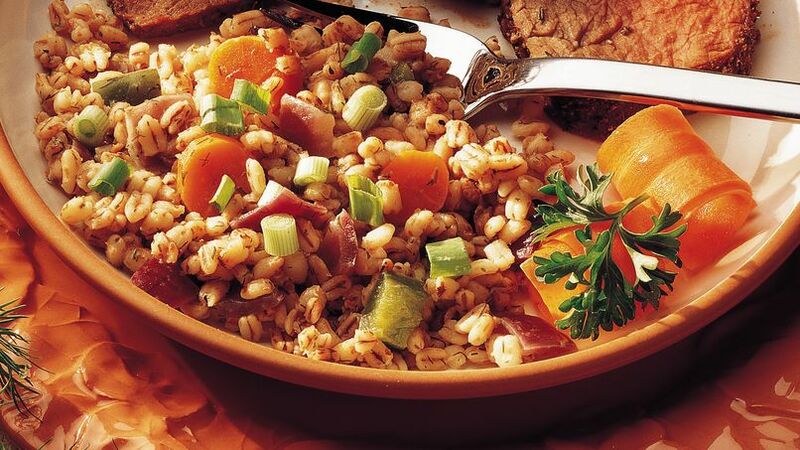 Barley is loaded with fiber—the soluble kind that helps to lower blood cholesterol. Start slowly so you have time to get used to more fiber! Is it a comforting casserole side dish or a meatless main course? You decide!